NIAGARA Carbide Square End Mill 0.256" 4FL TiN 0.256" x 1-1/8" x 3"
1x Set (10pcs) 4 Flute Milling Cutter. Sufficient bending strength and wear resistance, slot milling, hole and the edge of the board,the surface is clean, neat, no glitches. Type: Four-Flute Spiral Bit. Material: HSS. Shank: straight. Size: 3mm, 4mm, 5mm, 6mm, 7mm, 8mm, 9mm, 10mm, 11mm, 12mm. Can be manually operated or installed in the drilling machine work. Detail Image. Canada, United Kingdom, Austrilia, France, Germany, Spain, Ireland, Italy, Others. Material: HSS. Special 4 flute end mill cutter design. Shank type: straight shank. 5pc x End mill cutter. 12mm 12mm 26mm 83mm. Mainly used in cutting and hook slots. Suitable for mold steel,cast iron,carbon steel,alloy steel,tool steel. HHIP 8600-0041 28 Piece Transfer Punch Set, 3/32"-1/2"
Application : 0-55 HRC chamfer milling. 1PC Chamfer Mill Cutter. Design: V Groove. Degrees: 90°. More convenient way of protecting the tool can be polished without unloading. We will try our best to solve the issue. CNC cutter bar model: R8 FMB22. 1 x R8 FMB22 Straight Shank Arbor. Cutter model: 400R 50mm. 1 x 400R 50mm Face End Mill Cutter. Cutter: 90°. Blade can fit a variety of materials. Body is made of high quality steel. 100mm 4" Diamond Segment Grinding Wheel Disc Grinder Cup Concrete Stone Cut NEW. 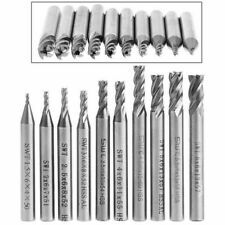 This is a set of single flute end mills cutting tool used in industrial milling applications. 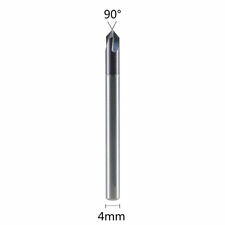 Single flute end mills are used for superior chip evacuation in high speed milling. Quantity: 10pcs. Shank Dia. : 4mm / 0.15". HSS Countersink Drll. 4 Flute Roughing End Mill. Type : End Milling Cutter. 4 Flutes, high rigidity, widely used in shallow slot, profile milling, and finish machining. Single End. All of our products are made by imported CNC Machine. Type: Flat bottom engraving bits. Suitable for CNC engraving machine. coated with titanium Improve the speed and feed rate of the tool ,Improve the surface wear resistance. Material: tungsten steel. Copper, Aluminum. Material: HSS steel and Aluminium. 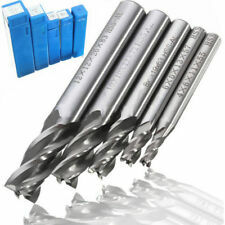 5 x End Mill Cutter CNC Bit Extended. Mainly used in cutting and hook slots. Total length: 68mm. Flute length: 24mm. Detail Image. High-density polished, superhard, wear-resistant, high temperature. This assorted back of 2" Flap Disc Type R Roloc Wheels are great for a wide variety of applications including dust removal, deburring, snagging, flash removal, and light grinding. Sanding Grinding Pad Abrasive Flap Wheel Grit 60 Sander Disc 90mmx25mmx16mm. 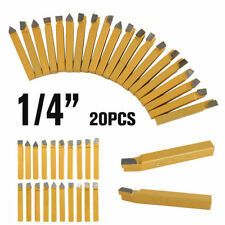 10pcs x Drill Bits. High wear sharp cutting edge, milling, hole and plate edge, surface clean, neat, no glitches. Used for PCB, SMT, CNC, Mould, plastic fiber, carbon fiber, super hard wood, printed circuit board, other precision parts processing. Type: Flat bottom engraving bits. Quantity: 10pcs. Degree: 10°. A power tool for 2D sculpture, 3D sculpture. High-precision tool grinding. Large capacity Chip elimination, high efficiency and good quality of products. High-density polished, lengthened, superhard, wear-resistant, high temperature. Material: HSS. Flute: 2 flutes. Flute length: approx. Application materials: mold steel, cast iron, carbon steel, alloy steel, tool steel. 3 x 6 x 200mm tool bit for lathe. Main Material： HSS. Overall Size: 3 x 6 x 200mm/ 0.12" x 0.24" x 8" (T W L). High speed steel tool bit for lathe. Main Color:Silver Tone. Material: alloy shank brass brush. 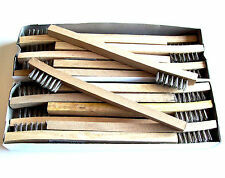 10pcs x Brass wire wheel brush. Brush shape: cup. Usage: remove paint, rust, decontamination, deburring, cleaning, etc. GBP 1.02 2835 sold. USD 1.25 3030 sold. Total length: approx 52.5mm. Model Number: M6 HRC50. Highest cutting hardness: HRC50. KVS Features: HRC50 For general steel alloy steel mold steel. Flute quantity: 4. 1PCS Nitrogen Coated Straight Shank 4 flutes End Mill CNC tool 6MM. Center and spotting drills are traditionally used to make a conical hole for a lathe center in order to make a starting point for a standard twist drill, designed to prevent the twist drill from walking. Type: milling tools. Applicable machine tools: milling machine. 1pc x milling cutter. Material: tungsten steel. Use of new ultra-fine fine tungsten steel bar grinding, high rigidity and toughness. Round handle, chamfering, easy to use, increase the stability of the performance. Highest cutting hardness: HRC50. Four flute design provides small chip loads and quicker removal. The real color of the item may be slightly different from the pictures shown on website caused by many factors such as brightness of your monitor and light brightness. Excessive shaking and tapping will affect the tilt, and even broken tap! Suitable for fast drilling, tapping and durable. Category: wire tapping. 1X6 pcs Screw Spiral Tap. Shank: 1/4 " （ 6.35mm ） hex quick change shank. CNC Titanium little drill bit. Titanium little drill. TiN coating nanotechnology, high hardness, high wear resistance, high accuracy. Full length: 38mm. Quantity: 10pcs. These bits can be used in 10 x milling cutter. Cutting edge length (CEL): approx. Total length: approx. Color: as picture shows. Material with High quality Tungsten Steel. Wood, Plywood, Hardwood. 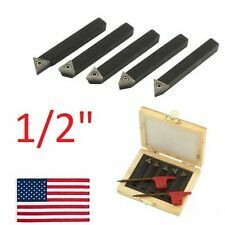 7Pcs HSS CNC Straight Shank End Mill Cutter Drill Bit 1/8" 5/32" 3/16" 1/4" 5/16" 3/8" 1/2". 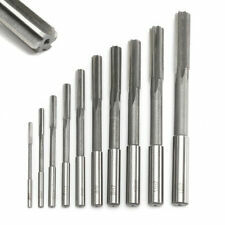 7pcs 4 Flute End Mill Cutter Material: HSS steel or HSS&Aluminium. Type: Four Flute CNC End Milling Cutter. Cutting edge length: 4mm. after you have paid. 4 - 8 weeks to Italy, Brazil ,Russia. MT2 Arbor with M10 drawbar50MM Face Milling Cutter 4 Flute with10 pcs Square AMPT1604 PDER carbide insertsUSED For plate cutting , Hardenless insert used for Steel meterialMaterial: CarbideColor: SilverDiameter: 50mm (2 inch)Diameter2: 22mm (drawback hole size)Height: 45mmFlute: 4Square Inserts Type: APMT1604Spanner: T15Package Included: 1 X MT2 -22 with 400R 50mm Face Cutter10 X Square AMPT1604 PDER Carbide Inserts1 X Spanner(Wrench color random,Does not accept the specified color)Only the above package content, other products are not included.Note: Light shooting and different displays may cause the color of the item in the picture a little different from the real thing. The measurement allowed error is /- 1-3cm. MPN Does not a. Sharp cutting reasonable matched with high strength of cutter. Blade length: L1=4 6 8 12 12mm. Chatter resistant design for superior surface finishes and long tool life. Arc relief angle makes tool better wear-resistance. Type: milling tools. Applicable machine tools: milling machine. 1pc x milling cutter. Material: tungsten steel. Use of new ultra-fine fine tungsten steel bar grinding, high rigidity and toughness. Whether it is coated: Yes. 1 x 6mm Chamfer Mill Cutter. Type : Angle Milling Cutter. More convenient way of protecting the tool can be polished without unloading. Drill bit chip evacuation space large, chip evacuation resistance small, chip removal smooth. 10 x Drill Bit. Cutting Edge Length: approx. High strength and hardness. The cutter point: 0.1mm. 10 x Engraving CNC Bit. Angle:45 degree. Cutting Edge's Length: Approx.11mm. Canada, United Kingdom, Austrilia, France, Germany, Spain, Ireland, Italy, Others. 115mm/4.5'' Flap Wheels Grinding Sanding Discs 40/60/80/120 Grit Angle Grinder ! Grit: 180#. 1x grinding wheel. Color: Silver and brown. Canada, United Kingdom, Austrilia, France, Germany, Spain, Ireland, Italy, Others. Used for PCB, SMT, CNC, Mould, plastic fiber, carbon fiber, super hard wood, printed circuit board, other precision parts processing. 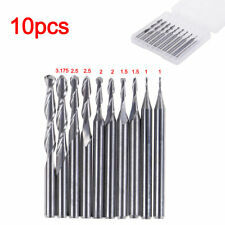 10pcs x Drill Bits. High wear sharp cutting edge, milling, hole and plate edge, surface clean, neat, no glitches. Trending at C $6.20eBay determines this price through a machine-learned model of the product's sale prices within the last 90 days. Helical 3/8" (.375) Carbide 4 flute Endmill New!! R&N 1/2"-13 NC LONG PULLEY TAP 3 FLUTE 6" LONG SPPT PLUG SM SHANK MADE IN USA! !